For my purposes today, I will be using the Arduino IDE, an application written in Java in combination with my own fabbed TinyISP. In my limited experience, it is quite similar to Processing. (Unfortunately, I have forgotten everything else about Processing.) Programs may be written in any programming language for a compiler that produces binary machine code for the target processor (wikipedia). 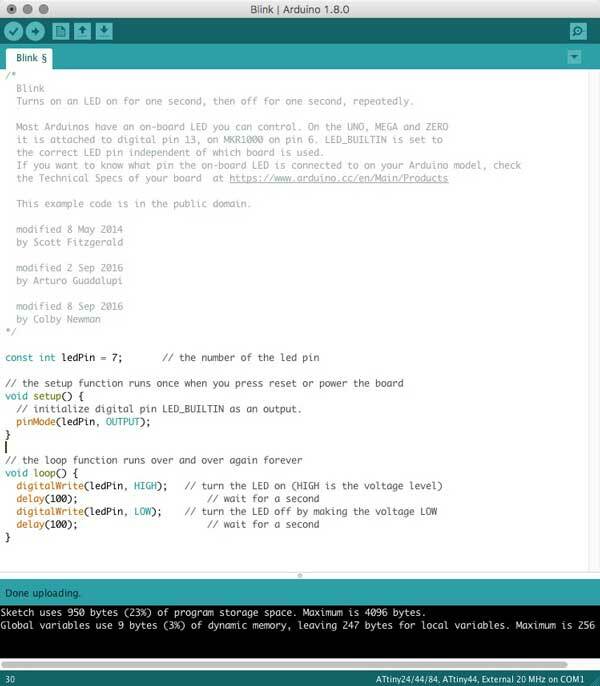 Copy the URL into the Arduino application's board manager. 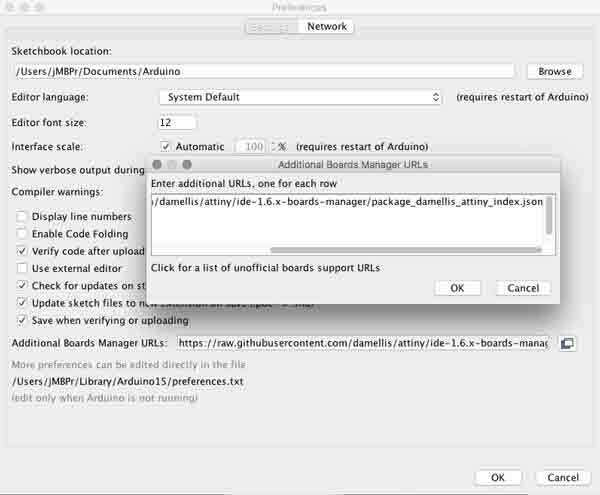 File>Preferences "Additional Boards Manager URLs". 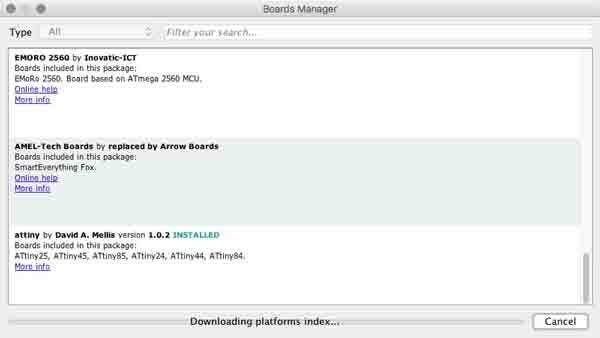 From Tools>Board>Boards Manager... Find the corresponding entry for the board you added and click the install button. 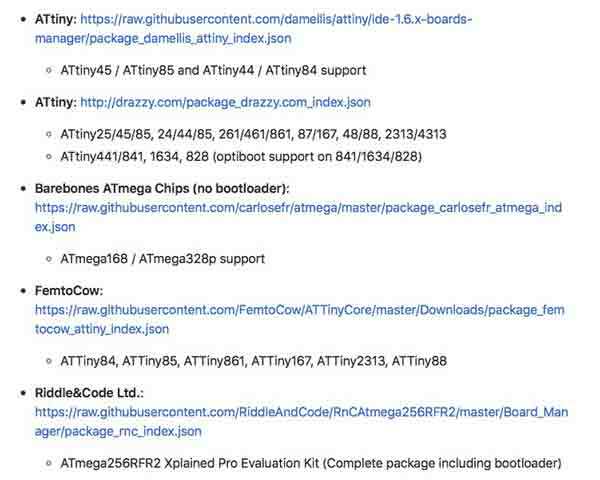 Arduino will download the stuff it needs to work with your board. One last step before coding for your board. You will need to translate your microcontroller pin-outs to Arduino friendly speak. Google is your friend. For instance the ATtiny44 pin 6 needs to be designated as Pin 7 in Arduino. Pin 6 (Arduino 7) is the location of my LED and Pin 10 (Arduino 3) my switch. The programming window will open with Blink. Super! The setup function is called just once when the sketch is loaded and/ or after a restart or power-up (not the mushroom variety of power-ups). This area is for loading libraries, initializing variables, input and output pin modes, etc. 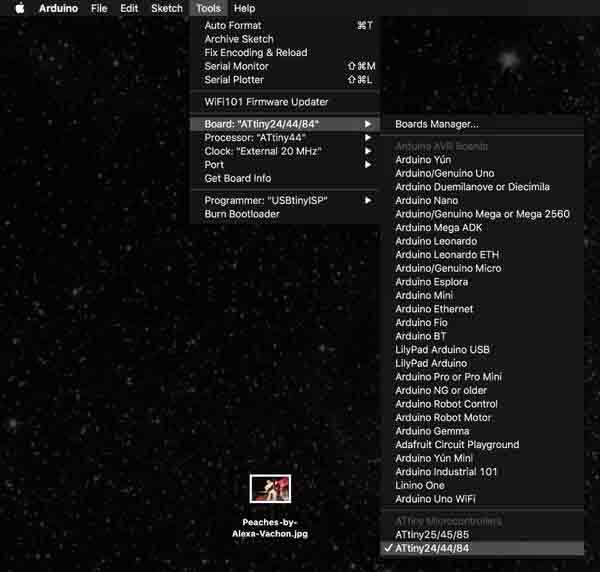 Following the setup, the loop is the main program which will run FOREVER. Or, until the board is reprogrammed or powered off. The program runs sequentially. First, the LED is turned on. Then the microcontroller is told to hold tight for a timed interval, here, one second. After, that interval, turn the LED off and wait another time interval. Repeat. That means, return to the first line of the loop, and work through the commands again. And again. Again. Again! One problem though, the "LED_BUILTIN" refers to an Arduino on-board LED, not my custom board. I need to specify my LED pin 6 (Arduino 7). I can do this by changing the three "LED_BUILTIN" locations to "7". Or, I could specify an integer, the primary data-type for number storage and change the "LED_BUILTIN" to my integer variable name. In this syntax, you can see the structure. "int" tells Arduino this is an integar. This needs to be written exactly as so. "var" is your integar variable name and "val" is the value you assign to this variable. I will write that somewhere above the void setup and then change "LED_BUILTIN" to "ledPin", my integar value. I added the "const" keyword, meaning constant, because this is an integar that never changes. With the fabISP, the ATTiny44 board and your computer interconnected, press the arrow button to load the program to the ATTiny44. And, I have a blinking LED! Believe me, it is blinking. Wait for it. Unfortunately, the LED is blinking on an estimated 8 second delay instead of the intended 1 second. Perhaps there is a necessary conversion for the 20MHz clock speed with the ATtiny44 using Arduino, my confusion over proper conversion of the delay(time) and 20MHz CPU speed, a calibration between the external resonator and the ATtiny44, or confusion with the clock speed / clock prescaler. I changed the delays to 100 and the LED began blinking at nearly one second on, one second off. I tried adding some code from the ATMEL datasheet (page 30) into my Arduino sketch to adjust the clock prescaler (haha): nothing. Shooting in the dark here. Thanks to Karsten Nebe, this code directly manipulates the registers and is more efficient. The delays set to 125 makes for 1 second blinky. 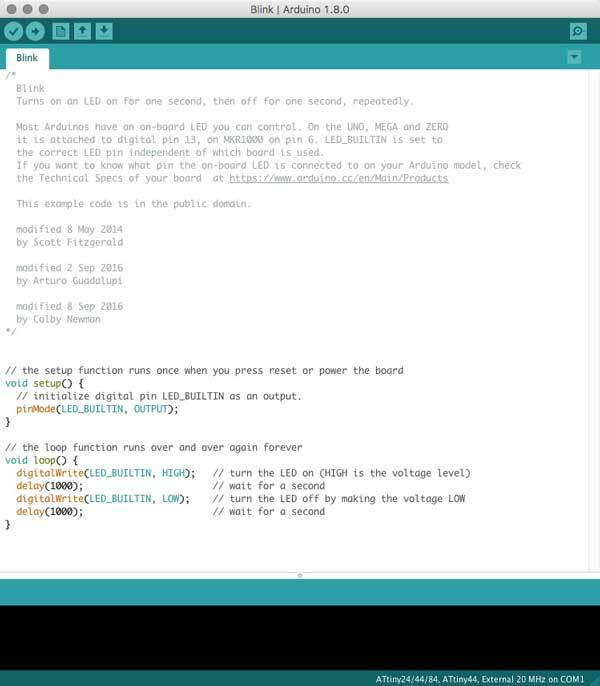 Arduino : Arduino website full of great resources. 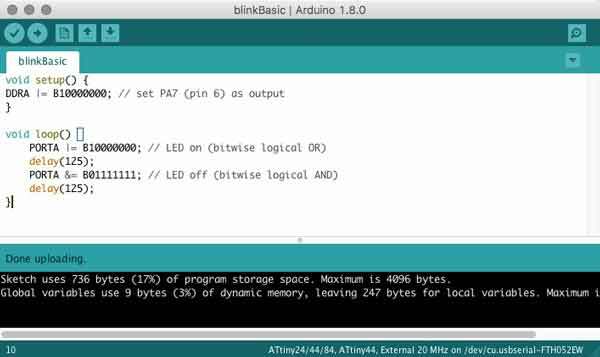 Programming an ATtiny w/ Arduino 1.6 : high-low tech's tutorial on the same subject. 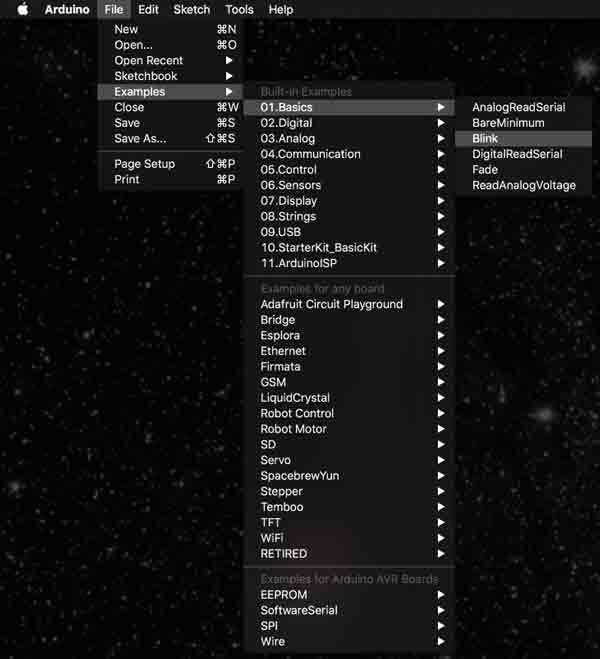 Arduino wikipedia : everything is linked to this site, right? Port registers : Port registers allow for lower-level and faster manipulation of the i/o pins of the microcontroller on an Arduino board - as shown in the blink basic example.